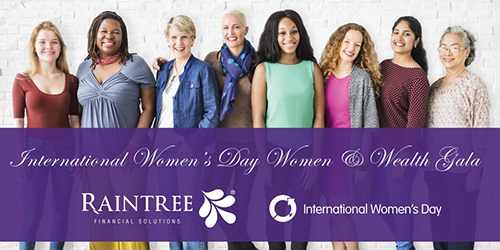 Join us in celebrating International Women’s Day at our third annual Women and Wealth Conference on March 8th, 2018 at the Enjoy Centre in St.Albert, AB. This year the theme is “Celebrating Health and Wellness”. Despite the social inequality women experience and the health issues that subsequently arise, women live longer than men. Twice as many women suffer from depression (National Institute of Mental Health), half of all Canadian women have been victims of physical or sexual violence (Canadian Women’s Foundation), women experience higher stress and more chronic disease than their male counterparts yet women still live an average of 4.7 years longer than men do (CBC). Women earn an average of 20% less than men (Catalyst Canada), experience job insecurity and lack of potential for career progression and in many countries, don’t have the same human rights as men. So why do women live longer despite the gender gap and health issues? It could be because, in general, women are more conscious and have higher awareness of their physical and mental symptoms, or could it be because women are just more resilient!? The goal of our gala is to inspire our guests to live their healthiest and happiest life by listening to our speakers share their experience of health and wellness and the impact it has had on their lives. International Women’s Day is a worldwide celebration of the social, political and economic achievements of women past, present and future. In some countries including Bulgaria, Russia, Vietnam and China, it is a national holiday and is celebrated by both men and women. International Women’s Day has been observed since the early 1900s and continues to be celebrated today. Join us for a buffet dinner and cash bar and take part in an evening of inspiration. Our talented MC, Carrie Doll, will engage the speakers and audience in an interactive Q&A following each presentation and will ensure the evening is spectacular from start to finish. Before embarking on a career of speaking at and organizing events, Carrie spent 13 years as a news anchor for CTV Edmonton. All Gala attendees will receive a Women’s Day Gift Bag with contributions from Cloud Nine Pajamas, My Daughter Fragrances, HQ salonspa, Bella Maas Boutique, Interior Matters and Hillberg & Berk. Even though this event is for International Women’s Day, everyone is welcome to attend! Please note that there is free parking at the Enjoy Centre, however it is limited to 200 spaces.